The Aquastar 38 is a luxury off shore semi-planing capable cruiser. 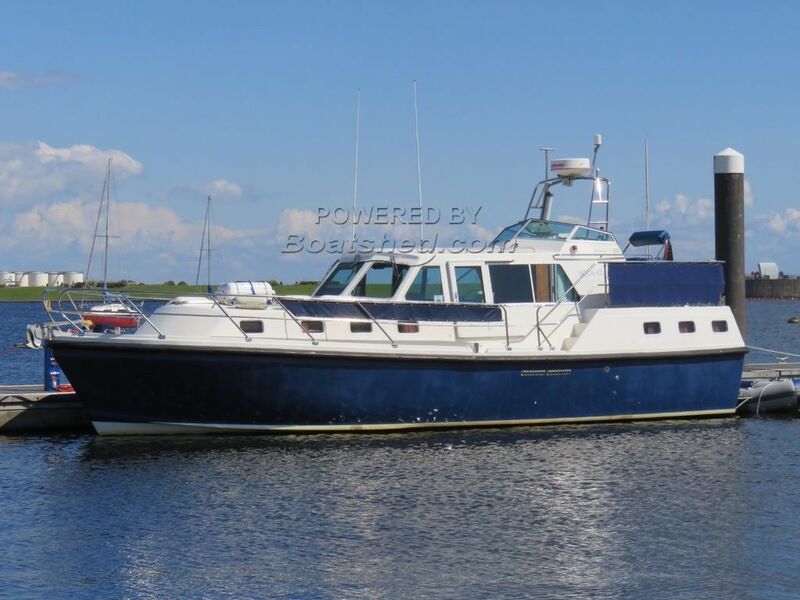 She is well made and well appointed and is able to stand the most demanding of conditions. This vessel has had a lot of money spent on her in the last couple of years in preparation for her passage to Scotland and back. The accommodation comprises of a large wheel house with plenty of seating around the table and there are 2 captains chairs at the helm position. A single berth can be made up in the wheelhouse if required. The owners cabin is aft with a large double berth, ample storage space and an en-suite toilet and shower. Moving forward the dinette, which converts to a double berth, is located to port with the galley to starboard. Forward there is a another toilet plus shower and the forward cabin has 2 single berths. She can be helmed from the bridge deck as well as the wheelhouse. There is ample seating around the stern deck to enjoy evening drinks. This is a vessel that any discerning yachtsman would be proud to own. This Aquastar 38 has been personally photographed and viewed by Keith Doust on 07968 375172 of Boatshed Wales. Click here for contact details.